Sutter Creek, California is located 45 miles East from Sacramento, 110 miles from Yosemite, 135 miles from San Francisco and 80 miles from Tahoe/Reno, Nevada. 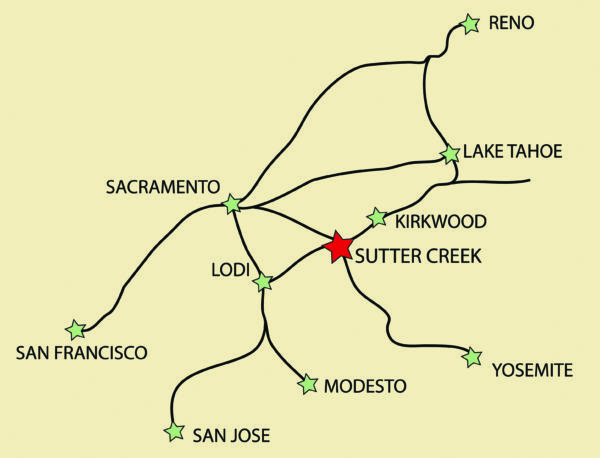 Sutter Creek is just minutes from the great Zinfandel wines in the Shenandoah Valley, El Dorado county’s Fairplay wineries, Calaveras County and Lodi. Sutter Creek is nestled between the towns of Jackson, Plymouth, Amador City and Volcano.